A brave performance from the exiles wasn’t enough as Riverside’s quality was too much in the 2nd half. The Exiles started well and despite falling behind went into the break level through a well worked goal from Nicol after good build up play from Grant, Hamamcioglu and Harrold. Riverside flew out of the blocks after half time scoring four quick goals to effectively end the tie. 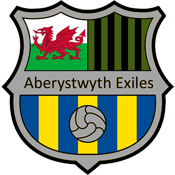 The Exiles battled till the end but couldn’t stop them scoring two more.